Endurance™. A battle card game for two players. To play the game you just need a friend and 2 starter decks - one for each player. The current version of our starter deck consists of 75 cards, divided into 4 types (29 Damage Cards, 13 Savior Cards, 8 Power Cards, and 25 Health Cards). Each card type has its own unique design format. 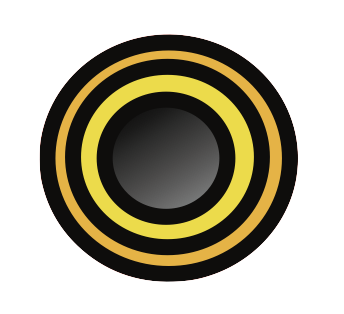 The use of colors drives most of the game dynamics so instructions are simple and the game is fast to play. When do you play the different card types? Damage Cards: Play these cards against your game opponent at the beginning of each player's game round. Each Damage Card has one of six possible colors. Savior Cards: Use these cards to defeat your opponent's Damage Cards! A Savior Card can only defeat a Damage Card whose color is listed as one of the Savior's strength colors. Power Cards: Use (+) points to increase damages if the color matches the Damage Card you want to play. Or, use (-) points to reduce damage when defeating an opponent's Damage Card. Health Cards: Start the game with 1,000 Health points. If you can't defeat a Damage Card, you lose Health points. Each starter deck contains five 100-points, and twenty 25-points cards. The current version of the game has a total of 32 unique card designs (16 Damage Cards, 2 Health Cards, 8 Savior Cards, and 6 Power Cards). If the Kickstarter campaign shows promising signs, additional cards might be designed and added to the game. Want to play this game using real cards? A successful campaign will fund the printing of real game decks. Winning Strategy: Don't lose your Health Cards!!! Both Player 1 and Player 2 start the game with 1,000 points (25 cards) in their Health Card piles, and a hand of 7 random cards drawn from their own starter decks. Each player keeps all other remaining 43 cards in the starter deck until they're used. Player 1 starts the game by putting down a Damage Card. At the beginning of a player's attack turn, the player puts down a Damage Card (and optionally, a Power Card). If the player doesn’t have a Damage Card to play, the player misses the attack turn. Player 2 now has to defend against Player 1's Damage Card. At the beginning of a player's defensive turn, the player takes a card from the starter deck and tries to play a Savior Card (or alternatively, a Power Card) to avoid losing Health points. Player 1 plays the RED Space Invaders (300 points) Damage Card against Player 2. 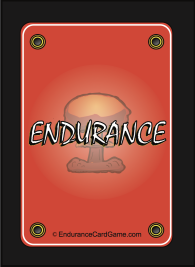 Player 2 can also try to get around by using a Power Card that reduces damage against RED Damage Cards, as seen here with the Bunker Power Card. a. Use a Savior Card, and no Health Card points are lost! This is your best play. b. Using a valid Power Card in a defensive play, decreases the damage by that amount. c. Using a valid Power Card in an attack play, increases any damage by that amount. If a player loses Health points, just move the Health Cards to the discard pile. And the gameplay continues with players taking turns, defeating and attacking. A player wins the game when its opponent runs out of health points. If you want to see a detailed gameplay experience, check out the following recording. The video features the online game version that was specially created to support the Kickstarter campaign. If you have any other questions, ask us on twitter! » How far along are you in the game development? » Do you have any experience in game development? Yes, as you can see in the online game prototype. We also have a different game in the iTunes App Store. » How can I get the real cards? Check out our Kickstarter campaign for specific details. » How long have you been working on this? Since about late January of 2015. » Your virtual game is cool, but I found a bug. Should I tell you about it? Sure. Our priority is getting the real card game out, but the virtual game can be updated, if necessary. » I have a suggestion to improve the game! Tell us about it. If it's something requested by a lot of people, it might be something we incorporate into the final version of the game. » Is the actual card game going to be exactly like the online version? As of now, yes. Except that you will play with actual Health Cards instead of the digital counters :-) Each player starts with 1,000 Health points in a combination of five 100-points cards, and twenty 25-points cards. » Will the actual card game have the exact same cards as seen in the online version? As of now, yes. But depending on how successful the Kickstarter campaign turns out to be and also depending on any feedback received, the current set of card designs and assigned points might be slightly updated. 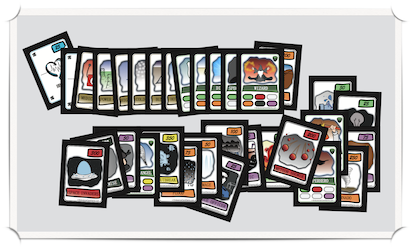 All artwork, technology, game and business dynamics around the Endurance Card Game were developed by the LessaWorld Company, inspired by card game ideas conceptualized by 2 very creative kids when they decided to spend a few hours without any electronics around.